In order to stabilize and supply water at the waterworks, it is necessary to monitor and record the operating status of the feed water pump and the volume of supplied water. Recording has traditionally been carried out using chart recorders and periodic recording of meters (indicators). However, in addition to having multiple pumps operating at each purification plant and water distribution office, since these plants are widely dispersed, users wished for systems that would allow for centralized monitoring. 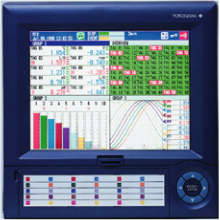 The DAQSTATION paperless recorder is equipped with a wealth of MATH functions that not only reduce running and maintenance costs, but also enable automation of statistics and monitoring of extensive networks. By introducing the paperless DAQSTATION, you gain the highly reliable recording that comes with zero moving parts (CompactFlash model). In addition to being able to reduce running and maintenance costs, you no longer need to be concerned about running out of ink or paper jams. Also, through a wide variety of monitoring screens and dialog based setting screens on the LCD display, you can be up and running with only a half day of training. DAQSTATION is equipped with a wealth of MATH functions (optional) including statistics, and based on the instantaneous flow obtained from the flow sensors, you can automatically calculate total water volume in daily or monthly units. The previous method of periodic recording of indicated values of chart recorders and meters is eliminated, saving time on manual calculation of total volume of water. One of DAQSTATION's greatest features is that it comes standard with networking (Ethernet). Equipped with Web, e-mail, and other common communication protocols, it fits easily into your office network. By connecting DAQSTATION to the waterworks network, you can easily set up a chained operation from notification of abnormalities via e-mail to confirmation of abnormalities via Web browser (monitor). By combining the system with the DAQWORX Data Acquisition Suite software, you can combine multiple DAQSTATIONs on the network and centrally monitor them using a single PC. By creating a widespread network of multiple water purification and distribution plants dispersed throughout the city, you can monitor all areas within the city remotely from a central location. Additionally, DAQWORX also comes with statistical processing and e-mail notification functions allowing calculation of daily total water volume and notification to a water service technician in a remote location, plus conversion of measured data to Excel format for automatic transfer to a remote data server. Paperless recorder easily achieves remote monitoring with a variety of networking functions. By introducing DAQSTATION into your system with its high reliability and wealth of computation and networking functions (Ethernet), you can greatly reduce the labor and costs of monitoring and recording supply pumps at the waterworks. Also, by integrating the DAQWORX PC software, you can combine multiple DAQSTATIONs on the network and centrally monitor them from remote locations.